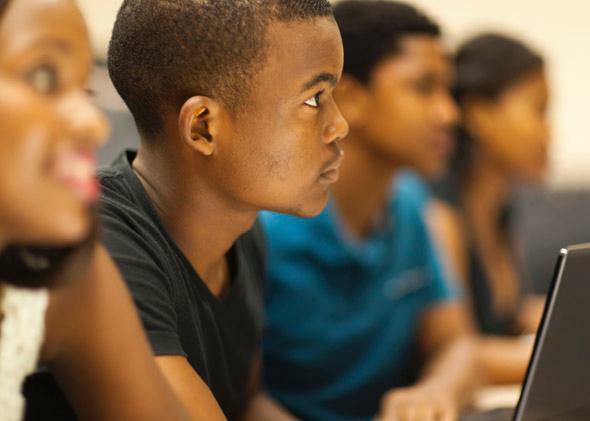 Talking white: Black people’s disdain for proper English and academic achievement is a myth. Black people’s disdain for “proper English” and academic achievement is a myth. She continues like this for nearly two more minutes, emphasizing the point that her speech reflects proper English and attacking the idea that it’s a deviation from black identity. If she was hoping for a positive response, she got it. In addition to thousands of shares and tweets, it reached more than 560,000 views and made the front page of Reddit. Not that this was a surprise. The main ideas—that black Americans disparage “proper English” and education and use a “broken” version of the language—have wide currency among many Americans, including blacks. “Ebonics” is mocked as a fake language, and efforts to use it in schools have sparked vocal opposition. When the Oakland, California, school board approved Ebonics for use in its schools in 1996, a flurry of public figures condemned the decision. “I understand the attempt to reach out to these children, but this is an unacceptable surrender, bordering on disgrace,” said the Rev. Jesse Jackson, who later reversed his stance, but not before he was endorsed by a wide range of people. At the time, linguists protested the criticism, noting the extent to which Ebonics—officially known as African American Vernacular English—is recognized as a language system with its own grammar and pronunciations, with roots in the regional dialects of 17th-century Great Britain. Far from being slang or broken, AAVE is a distinct form of English used by many blacks in informal settings. Still, it is true that so-called “proper English”—otherwise known as Standard English—is associated with white people. And there are many anecdotes and stories of black teenagers disparaging one another for using Standard English or “talking white,” which also tends to come with accusations of “acting white.” And, as we can see from the video, it’s these accusations that stand as Exhibit A in arguments for the existence of black pathology. In this anecdote, Riley provides the nut of the “acting white” theory: That blacks stigmatize academic achievement and code it as “white.” But as he notes in the book, the definitive treatment comes from the late John Ogbu, a professor of anthropology at the University of California–Berkeley. First, white people provide them with inferior schooling and treat them differently in school; second, by imposing a job ceiling, white people fail to reward them adequately for their educational achievements in adult life; and third, black Americans develop coping mechanisms which, in turn, further limit their striving for academic success. Ogbu was thorough and convincing enough to spawn a whole genre of popular work around “acting white.” Besides Riley, the most recent contributions include Ron Christie’s Acting White: The Curious History of a Racial Slur and Stuart Buck’s Acting White: The Ironic Legacy of Desegregation, which—like Ogbu’s work—argues that blacks lag in educational outcomes because of a cultural bias against academic achievement. By contrast, “acting white” accusations were least common at the most segregated schools, a finding echoed by a 2006 study from Harvard economist Roland Fryer, who found “no evidence at all that getting good grades adversely affects students’ popularity” in predominantly black schools. Across schools, the general pattern was this: “Acting white” accusations weren’t attached to academic performance and rather were a function of specific behaviors. If you hung out with white kids and adopted white fashions, you were accused of “acting white.” Smart kids were teased, but no more than you’d see in any other group. [C]ontrary to the implications of the burden of acting white and oppositional peer culture hypotheses—that white students generally have superior standards for academic achievement and are embedded in peer groups that support and encourage academic striving—the experiences described by some of our white [student] informants indicate the presence of a much less achievement-oriented academic culture. In interviews, white students describe ostracism from peers and apprehension from parents who want to avoid the perception of “elitism” that comes with children in gifted programs. With all of that said, let’s circle back to the video. “I don’t know why we’ve gotten to a place where as a culture—as a race—if you sound as though you have more than a fifth-grade education, it’s a bad thing,” says the woman. Ignore the mistaken attack on African American Vernacular English. Knowing what we now know about “acting white,” we should read this complaint in a different light. If her peers have mocked her for “talking white,” it might have less to do with her use of Standard English overall and more to do with its use in an unusual setting. Remember, for many Americans, Standard English is only used in formal settings—business and school, but not home. By forgoing the vernacular in informal speech, she might come across as elitist, in the same way it might seem pretentious to purposefully use professional jargon when talking with a nonspecialist. In other words, she isn’t being mocked for the English as much as she is for her refusal to code-switch and use informal language for an informal conversation. That might be unfair—let’s say you can’t actually speak the vernacular!—but it’s not evidence of pathology. Or, as a teacher might tell her students, there’s language for home, and there’s language for school, and sometimes, what works for one place might not work for the other.